The year is 1888, and priceless minerals have been discovered beneath the surface of Mars. Celerium could power humanity well into the future, and Sylvanite crystals are more dense than anything on Earth. Most significant of all, ice has been found, which could be used to give Mars an atmosphere and allow it to be colonized. A brutal competition to claim these natural resources had begun. Your mining company is determined to come out on top and claim the Red Planet's priceless minerals as your own. 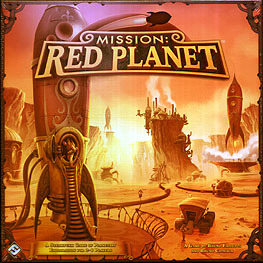 In Mission: Red Planet, two to six players assume the roles of Mars-bound mining corporations in a Victorian steampunk era. Players send astronauts to explore various zones of Mars and mine the planet's valuable resources. While staying true to the original game, this edition of Mission: Red Planet includes powerful new event cards and allows astronauts to explore the moon Phobos. These new features make this the definitive version of Mission: Red Planet. This is always a pleasure to play. The rules are simple to pick up and there is a very good mix of luck and strategy involved. The objective is to get you Astronauts onto the various areas of Mars. As you land you uncover one of three different types of Ore valued 1-3. During the game there are three scoring rounds 5,8 and the last round 10. On the first scoring round the player with the most Astronauts in an area gets 1 scoring token (that matches the Ore in that area) if there are any ties the token stays on Mars. In the second scoring round 2 tokens are awarded, ties split the tokens and any remainder stays on Mars. Finally in the third scoring round 3 tokens are awarded, ties re split as before with the remainder being discarded. During the game there are different roles that people can use which give them different actions they can take, some just have a useful purpose to the player, others also allow the player to destroy spacehips, remove Astronauts and other sneaky tricks. During the game you can collect event cards, these provide you with either additional Bonus points usually through having some conditions to be met or Discovery cards that change some aspect of one of the outer zones on Mars. Some of these have benefits and some provide detrimental affects to an area. These are only revealed at the end of the game so it can be quite nasty! The game is played over 10 rounds and once you have played a particular character you can not play it again unless you use the recruiter character which gets you all your charatcer cards back into your hand(including the recruiter). It becomes quite strategic as to when to use this card!. The theme is very well done for this game and the pieces are extremly colourful and well made. I would recommend this game for anyones collection. This is an enjoyable game about exploring Mars for minerals and so is an area control game not unlike El Grande. During setup each player is given an Event card which they keep secret and is their own set of victory conditions which awards bonus points at game ends if the conditions are met (more can be drawn during play as well). Each player has a set of characters from which they simultaneously choose one each round and reveal it. These are numbered and are played out in order. Basically, each character lets you load astronauts onto a spaceship headed for a region on Mars and also has some other ability which can help you or hinder an opponent, such as blowing up a spaceship or making one take off before its full. When astronauts arrive on Mars in an unexplored ares, its resource is revealed and during the three scoring rounds, resources are awarded for the player controlling that region. This is a good fun game that has a light hearted feel to it. I got this the other day for a games evening for four adults. It was an excellent game, with a relatively simple set of game mechanics, good quality manufacture, and some great touches in terms of strategies and rules. Early days with it yet, but it seems likely to become an established favorite in my household - already my 9 year old is bending my ear to let hime play.... Thoroughly good game!